That's because the smiley bar is initially 10 smilies wide. 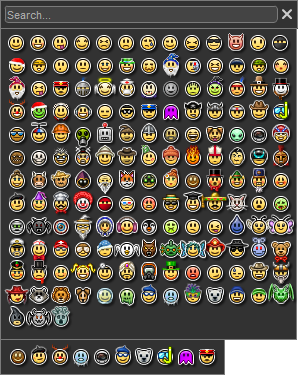 Having 3 unusable slots until you reach 130 smilies is kinda silly. That's been because it's expanded from 10 to 14 due to veterans having smiley slot taking over the game screen and can't reach the bars on the top of it. What about centering the selected smileys. just make the max 14 only if you have 130 smileys. It’s a reward for having 130 smileys because you’ll never use120 of them. So you basically want to make it look like this? That would ruin the beautiful rectangle. Fun fact: If you haven't noticed, favourited smileys have less spacing between them than smileys above. It's not so visible when you have 10 smileys, but it is pretty obvious with 14 smileys. I think i tried playing around with different spacings between the smileys so the smileybar wouldn't cover your actual smiley. But then i ended up moving the whole thing to the left. Fav Smileys bar on the other hand is a separate thing which isn't controlled by the same spacing as in smileybar. So i think i just haven't noticed the mistake. 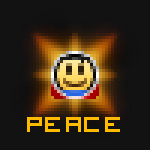 A designer smiley from 2017's Design Competition. Aka the ugliest smiley in the game.